Reports phoned from today's anti-war protest. 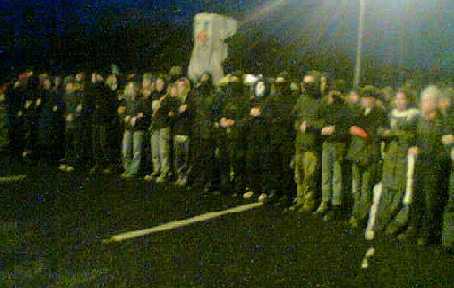 The protest in Shannon is continuing, about 300 or 400 protesters have arrived by buses and their own transport. The bulk of the participants are gathered at a roundabout - and at that, not the closest roundabout to the airport. There's a heavy police presence, one road is blocked off with concrete barriers etc. Gardai have set up a checkpoint and members of the public are able to drive right up to the airport as normal. Some protestors, "black bloc" or GNAW-types (who are there with good numbers), have gone closer and are running towards the airport. There are banners etc. at the roundabout protest. No reports of arrests to date. The two major arteries into the airport have been shut down. Primarily IAWM at one, Grassroots Network at another. There's been a few minor scuffles at the latter, but no arrests to date. Some humour added with one of the protesters doing his best Matrix impression in front of a line of riot cops. There are Gardai with shields, in helicopters, on horses and generally standing around. At one of the blocking points (the two groups are fairly far apart), there are about 40 Gardai. It's reported that the total presence is in hundreds rather than tens. Some speeches are being made as well - no details on who, however. RTE's report (updated regularly, see here: http://www.rte.ie/news/2003/1206/shannon.html ) currently gives a number of 300 and describes it as a peaceful march with a high Garda deployment. A further report. 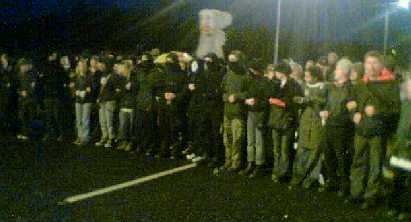 Speeches have been made at the "IAWM blockade" by Caoimhe Butterly, Nuria Mustafa, Colm Stephens, and others. A speech was read on behalf of Ciaron O'Reilly, who is camped out along with other Catholic Worker folks at the Limerick-Clare border. They are banned from being in Co. Clare. The buses were delayed for a while with Garda searches - poster sticks etc confiscated and bags searched. But now, there is a sizeable crowd listening to the speeches and sitting down. About 200 people. As mentioned in previous reports, the various protesters are fairly far apart and are communicating with each other by mobile phones etc. Earlier, the IAWM walked towards the airport, but didn't get beyond the overhanging sign, where there is a major Garda roadblock. Alright, these reports are coming from a number of sources by telephone - as always, there won't be a full picture until all get back to home base and can sit down and write up their thoughts properly. If you've been in contact with someone at Shannon, or were there yourself, feel free to add clarifications or corrections. see report entitled "Shannon" two stories down on wire! Just received: "Another mini-blockade as things wind down and people return to busses"
IAWM buses heading for home. A few protesters are inside the industrial estate running around but no word of exactly what they're up to. 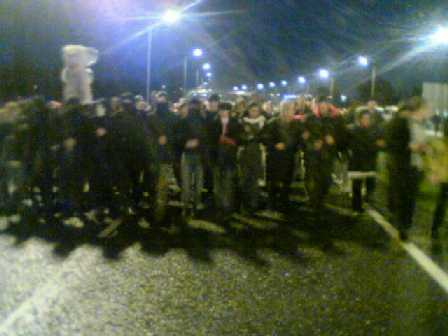 Some people heading to Limerick prison for a vigil. It's believed that two people have been arrested. There are also reports from a number of sources that "BlackPope", who would have been at the protest today, was arrested last night. Reason or potential charge unknown. Dublin radio stations (98FM, Spin FM, etc) have run short snippets on the protest. Spin referring, in their inimitable style, to "Gardai cracking heads today down in Shannon". BB were on telly, as were the other protesters (RTE 17:00) but it was all in irish so dont know what they said. The english bit at the end claimed 300 attendee's. The Black pope was arrested early this morning and will be brought before tulla court this evening at 6;30 if anyone is in the area..
fair play to everyone involved in the protests today ... is there talk of the shannon peace camp being opened back up again ? Sent via email from near the airport...more to follow, no doubt. Well about 400-500 people at it in all (my estimate). Moved off from Lidl, and the what I believe is the 'usual' route down to the terminal was blocked off by huge concrete blocks - this however was (i'm told) nothing to do with the protest but to do with roadworks. Anyway after a while of marching down towards the terminal, The dudes in black broke away from the march and started to run into the small forest thing. I was at the front of the march when this happened, so i don't know how it transpired. All I saw aqs cops chasing them. I think it was at this point that one guy, Oisin I believe his name is, was arrested. Then the march continued down until it met a gardai roadblock of layers of barriers and sour pussed coppers. Also I noticed some suss looking dudes lurking at the end of the long lane on the right, who when people went up to the gate with cameras, moved off. Who were these mysterious strangers I wonder? Anyway it became clear that no-one was getting past, so we looked for another way of stopping traffic. So on the march went, back down the road it had come up. At one point there was line of people doing a mad little dance around a roundabout. Then moved off again, but this time the GNAW crowd stayed put (and I have no idea what they did after that, apart from when I was leaving I saw them arriving at Lidl's). 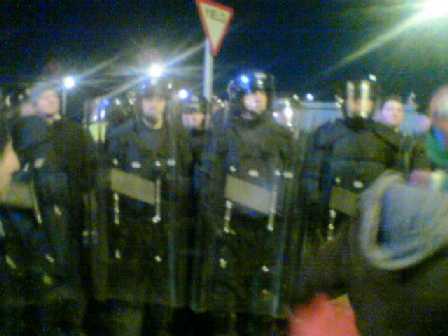 A sit down blockade type thing was attempted at the roundabout nearest Lidls (but not the one directly outside it), and at theis point the guards got a bitt rough and started grabbing people up off the road, pushing them around - doing the general gardai Vs peaceful protestors thing. In the end we blocked one lane of traffic, and a few speeches were made by; Nuria Mustafa, Mick Barry, Colm Stevens, Oisin Kelly, Caohime Butterly and some SWP guy (maybe Rory Hearne? I was on my way back into town to use the jacks at this stage). Back outside Lidl there were a few 'mini-blockades' of the roads. After about 45 mins, most of the IAWM crowd had dispersed, and the GNAWers were just arriving back. However, I was in a car on the way out at this point, and wasn't able to talk to any of them. I also saw that guy with the Soviet flag, and selling his phamplet "Stalin Today". And some dude from the IPSC in Kildare (?) was selling funky Xmas cards. I think he might have more for sale, if you want to contact the IPSC I'm sure they can tell you. They were cool cards though - million times better than any 'Happy Xmas, peace love and happiness" Hallmark crap. Also it is true that all sticks were taken off banners, placards etc by the cops before the busses arrived. Therefore the only banner with stick was the Kildare Anti War Movement one, which was at the front of the march. Good to see fellow culchies at the forefront! And as far as I'm aware, there wa sone definite arrest (that Oisin guy) and two others, a male and a female. But don't quote me on that, you know what these things are like. Loads of cops of all shapes, sizes, speices and sexes (but obviously not colours) . And a roving heli-pig with a big search light. Thats all i can really remember at the moment. ..many different species of guards were out and about at shannontoday...with dogs,horses,riot control,helicopter and unconfirmed reports of 4 fireengines with water hose at the ready up by the terminal building..interesting to know how many guards were there altogether...would have been cheaper to shut the airport for the afternoon!!!! !They did a pretty effective job of blockading the airport though!! The searching of protestors enroute to shannon was ironic...searching our buses and cars and baggage for guns and weapons??????? ?look in the u.s.planes ,idiots. We really had to run around the police and fight to get the first road blocked but we managed to do it after a bit of a ruckus with the coppers. Ufforunatly we found it was the wrong road. The stalin guy was a bit of a legend though. (22:11) A member of the Irish Anti-War movement who was arrested near Shannon airport this morning has appeared before Tulla District Court in Co Clare. Eoin Rice, aged 34, of Mayobridge, Newry, in Co Down, was arrested at Newmarket on Fergus, and faces two driving-related charges. He was released on bail and will appear in court in Ennis on Friday. So was fintan lane, Why? Because these people actually wanted the event to be a success and were directly involved in making it so. No SWP members would have ever been treated this way. very interesting photographs. The gardaí look more like a european paramilitary police force, and the protesters seem to be wearing the black block winter collection which is less black and morbid than usual, and probably quite fetching on some, and well it's less "black and morbid". And Eoin Rice, the Hon. Black Pope appears to be the subject of harrassment which verges on the ridiculous. And the idea that people may be "barred" from county Clare is really ridiculous. Well done everyone, hope you didn't get to hassled or wet & cold. "they just look like normal Garda (fat, red-faced, big ears, incredibly stupid, etc) with big padding on." The report was interesting, and well done to the black block for providing variety and creativity on the day. However, comments like the above are not only unfunny, they are also unhelpful and infantile. It's when activists resort to this type of juvenile commentary that people get turned off going to demos. If you want to critique the police and the ethics within the police force it might be better to choose a better basis than indulging in physical caricature. They are merely "workers in uniform." They may be more overtly implements of the state than the rest of us, but most anarchists have jobs by necessity, and most have to comply with the state in some less overt fashion. Let's be a bit more sophisticated in our analysis here, or the left as a whole is going nowhere fast in Ireland, and will remain remedial in its tactics, as it has been for some decades. He was at the Bin Tax Conference. Its a joke that RBB is allowed to hold so many positions. Chair of IAWM, Chair of Save Dun Laoire Baths, Chair of Dun Laoire Against Bin Tax. How could one person carry out all these tasks? He doesnt! Its all just to build up his profile for next years local elections. 8.20am: "Roger.... we see him. He's behind the fence. We have him now". 8.50am: (from the Airport Police)- "AP19. We've found something which may have fallen from a plane on the South Eastern end of the runway." Reply: "That's a roger. It may have come from the Polar Air flight that took off yesterday evening. Black smoke was seen coming from the back of the plane"
around 9am: "would you go to the flyover.... there's someone trying to put up a banner". around 11am: "Sgt. McMahon requires assistance with a horse that has bolted near Smithstown". 11.15: "We have that horse under control now"
12.40pm (approx): "All units. Be on the look out for a black car (reg and make given), property of a Mr. Edward Horgan (address given). He is to be stopped by any member that sees him. Doesn't matter how often he is stopped. His car to be stopped and searched"
12.45pm: "Five-Two would you come back to the station and collect some lunches. There's a lot of hungry members out there"
Reply: "Roger. On the way"
"Aren't you very good. You're marvellous"
2.45pm: "There's a few heads breaking away from the main crowd. We're trying to get them back"
3.50pm: "They have the roundabout blocked off. We need back-up fast"
Dangerous driving take 2. Black Pope. So a man who drives into ten people on a blockade gets away without an official caution, but de Black Pope is arrested for dangerous driving in an empty car park and doesn't get a solicitor? 'Clear out!' he cried, 'disordered wench!